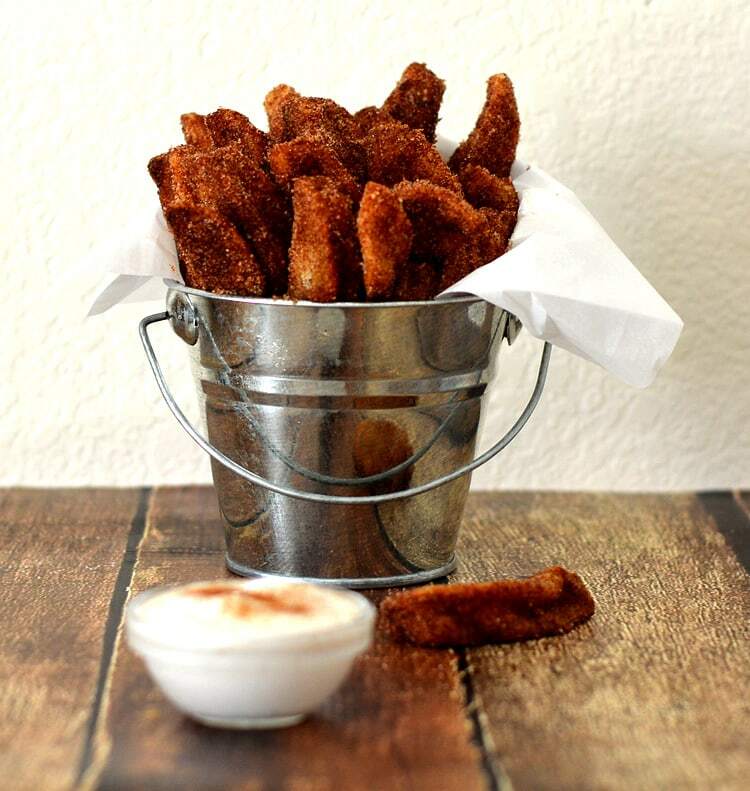 It seems like “fries” are all the rage. I’ve seen these in rings, julienned strips, wedges…you name it. However, these are usually coated in a batter of some sort (typically eggs and buttermilk), but I wanted to lighten it up and of course, veganize them. 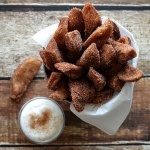 So these Apple Fries with Vanilla Whipped Cream are an easy treat that both kids and adults will love. The trick here to is be sure your oil is hot enough. Test a small apple slice before beginning a batch. If the oil is not hot enough, the apples could absorb the oil and that is definitely not what we want. The quicker they fry, the quicker they develop a crisp outer crust which prevents the absorbption of excess oil. Additionally, you don’t want the apples to cook so long they get overly soft and potentially mushy. Do not overcrowd the pan or the temperature of the oil will drop. Allow the temperature to come back up between batches. After they’ve drained on paper towels and cooled for a few minutes, toss with the cinnamon sugar mixture. Allow to continue cooling a few more minutes before serving. Serve warm. 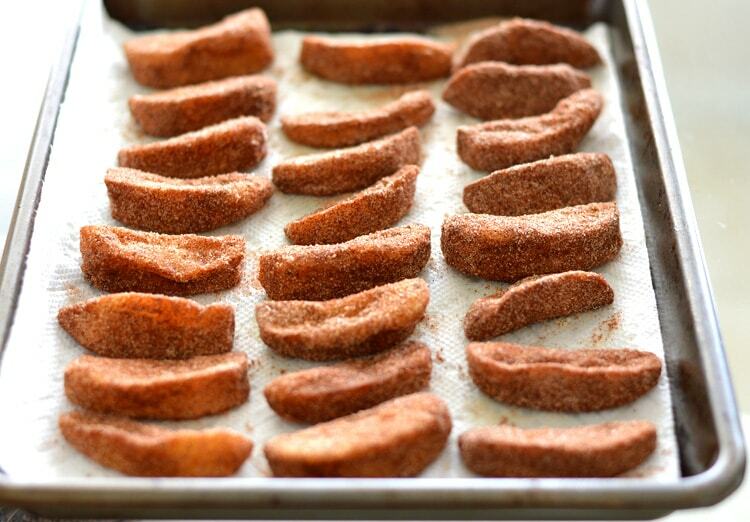 The cinnamon sugar gives these Apple Fries a deep, warm color. There is tartness from the apple, sweetness from the sugar and let’s not forget the Vanilla Whipped Cream. You can make your own whipped cream from coconut milk, but today, we used the new So Delicious Dairy Free Coconut Milk Whipped Topping (coming soon to stores near you :). 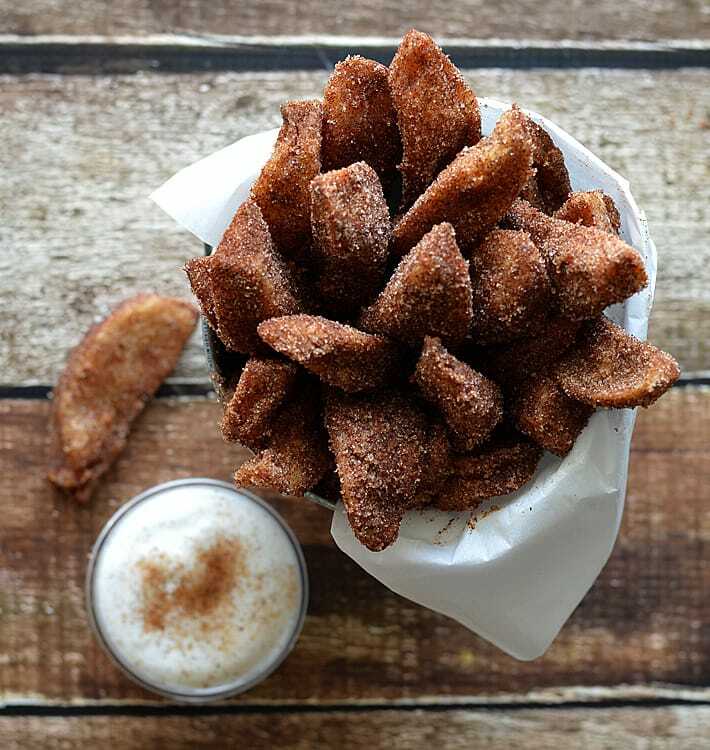 We added vanilla extract and topped with a bit more of the cinnamon sugar mix. The cool whipped topping is a nice contrast to the warm apples. Begin by heating enough oil to coat the bottom of whatever pan you are using. Use high heat. Working quickly, combine the cinnamon and sugar in a small bowl. Set aside. Peel, core and slice apples. Toss in cornstarch. Once the oil is hot, test a small piece of apple to be sure it sizzles. If not, give it another minute or two. 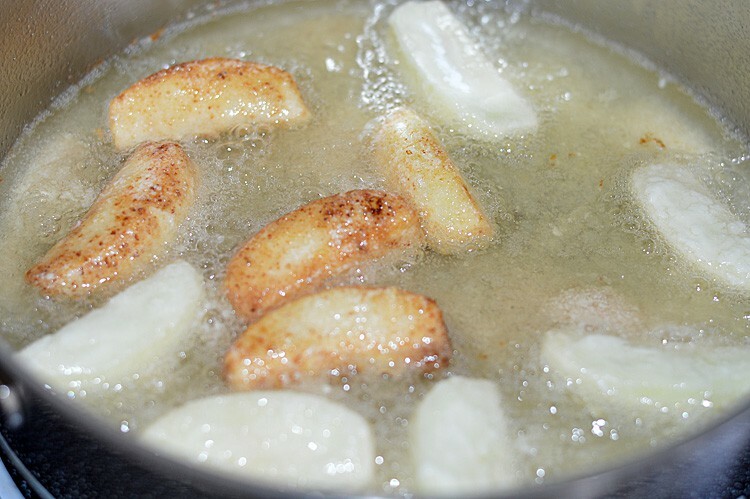 Place a few of the cornstarch-coated apples into the hot oil and fry on each side for about 3 minutes. They should be just golden brown. Line a cookie sheet with paper towels and transfer the cooked apples to drain for a few minutes. Toss in the cinnamon sugar mixture. Combine the whipped topping and vanilla and top with leftover cinnamon sugar to serve. First off – these look too delicious that you’ve tempted me into making them tonight! However I had a question about the recipe; I only have sunflower oil in my cupboard at the moment, would this work okay (instead of canola)? Hi Besma, I am not too familiar with sunflower oil and frying, but I did a little research and it looks it should be just fine 🙂 Enjoy!! Can’t wait to try to make these! Never had sweet fries like these before. Definitely a recipe I need to recreate.. they look and sound incredibly delicious. Looks so delicious, I would love to have some right now..
Hi, these look amazing but I am very allergic to corn. Any suggestions? Nicole, you can use any oil that is suitable for frying so no corn oil there. You could also use arrowroot powder instead of cornstarch. Hope that helps! Love this recipe. I also love coconut so I did half tapioca flour and half coconut flour and it was amazing. Still didn’t fully go crisp though. Also swapped the sugar for coconut sugar :). Looks delicious! Always looking for dessert recipes! I have a deep fryer for french fries. Could I use that? These look amazing! Can’t wait for the baked version. Hi…Could you use rice flour ? Also, do you whip the coconut milk like you would heavy cream? I made the apple fries last night It was good and plan on making again.